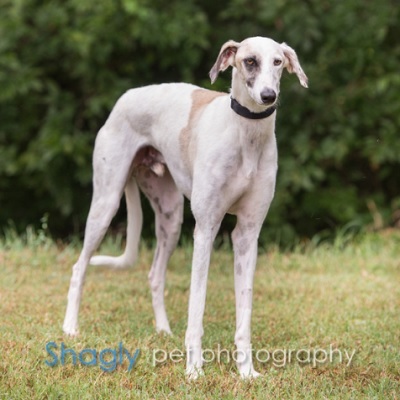 Yukon is an almost 2-year-old white and fawn male born July 14, 2015 to a Saluki mother and a greyhound father. 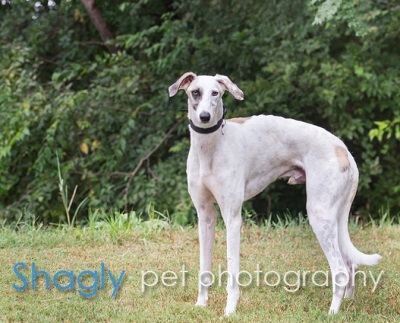 He and his sister, Denali, were surrendered to GALT by an owner who could no longer care for them. Yukon is heartworm positive and is being kept calm during his treatment. Yukon has been successfully treated and is now heartworm negative! Yukon is a small sweet boy who doesn’t take up much room. He’s occasionally a bit shy around people, but is fine once he warms up. He loves to cuddle and doesn’t mind if you share his dog bed to cuddle him; though he will guard his bed from other dogs, but only seems to do this when he’s tucking in for the night. Otherwise, he plays well with all dogs he meets, loves to greet dogs and people, and doesn’t mind getting cozy with dogs or people. Yukon is very gentle and acts very puppyish. He likes to run and play in the yard with anyone who will play with him. Yukon walks really well on a leash. He lives with kitties in his foster home and although he’s curious about them when they do something weird, he does not approach them and gives them space to do their own thing. If his forever family doesn’t mind, I am sure Yukon would love to snuggle up on the sofa or bed. Yukon needs to be part of a pack or have at least one other dog around. The special medical treatment cost needed by Yukon is why the Miss Mesa Fund was established. If you would like to help with Yukon's care, please take a moment to make a donation to the fund. You WILL and CAN make a difference in Yukon's life and the lives of other greyhounds in need of special medical care. Your help and support will make a difference - one greyhound at a time. Please note Miss Mesa Fund/Yukon on your check.